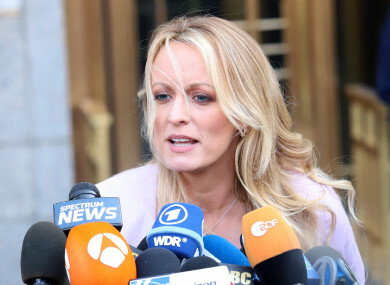 Stormy Daniels outside a court in New York. US PRESIDENT DONALD Trump has referred to Stormy Daniels as ‘Horseface’ and has threatened to sue the former adult actress. Trump tweeted the insult this afternoon, after a judge yesterday dismissed a defamation lawsuit taken by Daniels against him. Daniels, whose real name is Stephanie Clifford, claims she had a tryst with Trump in 2006 while he was married. The president denies the affair and has also denied that payments to his lawyer totalling $130,000 were made to cover the cost of hush money paid to Daniels. Daniels responded to Trump’s tweet, referring to him as “Tiny” and saying that he had demonstrated a “hatred of women”. Daniels sued Trump in April after he said a composite sketch of a man she said threatened her in 2011 to keep quiet about an alleged affair with the real estate mogul was a “con job”. Trump tweeted that the man was “nonexistent” and claimed Daniels was playing the “fake news media for fools”. He also retweeted a side-by-side photo comparing the sketch with a photo of Daniels’ husband. However, in an order handed down yesterday, US District Judge S. James Otero said that Trump’s statement was protected speech under the First Amendment. Daniels was paid $130,000 as part of a nondisclosure agreement that was signed days before the 2016 election, and is suing to dissolve that contract. Email “Donald Trump tweets insult at Stormy Daniels and threatens to 'go after' her”. Feedback on “Donald Trump tweets insult at Stormy Daniels and threatens to 'go after' her”.